NASA’s Pluto-bound New Horizons spacecraft has traversed the orbit of Neptune. This is its last major crossing en route to becoming the first probe to make a close encounter with distant Pluto on July 14, 2015. 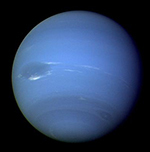 The sophisticated piano-sized spacecraft, which launched in January 2006, reached Neptune’s orbit — nearly 2.75 billion miles (4.4. billion kilometers) from Earth — in a record eight years and eight months. New Horizons’ milestone matches precisely the 25th anniversary of the historic encounter of NASA’s Voyager 2 spacecraft with Neptune on Aug. 25, 1989. “It’s a cosmic coincidence that connects one of NASA’s iconic past outer solar system explorers, with our next outer solar system explorer,” said Jim Green, director of NASA’s Planetary Science Division, NASA Headquarters in Washington. “Exactly 25 years ago at Neptune, Voyager 2 delivered our ‘first’ look at an unexplored planet. Now it will be New Horizons’ turn to reveal the unexplored Pluto and its moons in stunning detail next summer on its way into the vast outer reaches of the solar system. Using detailed information collected by ESA’s Rosetta spacecraft during its first two weeks at Comet 67P/Churyumov-Gerasimenko, five locations have been identified as candidate sites to set down the Philae lander in November – the first time a landing on a comet has ever been attempted. Before arrival, Comet 67P/Churyumov-Gerasimenko had never been seen close up and so the race to find a suitable landing site for the 100 kg lander could only begin when Rosetta rendezvoused with the comet on 6 August. The landing is expected to take place in mid-November when the comet is about 450 million km from the Sun, before activity on the comet reaches levels that might jeopardise the safe and accurate deployment of Philae to the comet’s surface, and before surface material is modified by this activity. The comet is on a 6.5-year orbit around the Sun and today is 522 million km from it. At their closest approach on 13 August 2015, just under a year from now, the comet and Rosetta will be 185 million km from the Sun, meaning an eightfold increase in the light received from the Sun. An international team of sky scholars, including a key researcher from Johns Hopkins, has produced new maps of the material located between the stars in the Milky Way. The results should move astronomers closer to cracking a stardust puzzle that has vexed them for nearly a century. The maps and an accompanying journal article appear in the Aug. 15 issue of the journal Science. The researchers say their work demonstrates a new way of uncovering the location and eventually the composition of the interstellar medium—the material found in the vast expanse between star systems within a galaxy. Seven rare, microscopic interstellar dust particles that date to the beginnings of the solar system are among the samples collected by scientists who have been studying the payload from NASA’s Stardust spacecraft since its return to Earth in 2006. If confirmed, these particles would be the first samples of contemporary interstellar dust. A team of scientists has been combing through the spacecraft’s aerogel and aluminum foil dust collectors since Stardust returned in 2006.The seven particles probably came from outside our solar system, perhaps created in a supernova explosion millions of years ago and altered by exposure to the extreme space environment. The particles would be the first confirmed samples of contemporary interstellar dust. The research report appears in the Aug. 15 issue of the journal Science. Twelve other papers about the particles will appear next week in the journal Meteoritics & Planetary Science. “These are the most challenging objects we will ever have in the lab for study, and it is a triumph that we have made as much progress in their analysis as we have,” said Michael Zolensky, curator of the Stardust laboratory at NASA’s Johnson Space Center in Houston and coauthor of the Science paper. If you’re willing to rise before dawn on Monday, August 18th, you’ll be rewarded with the sight of the closest planet pairing of 2014 — and not just any planets, but the two brightest ones: Venus and Jupiter. On that morning, these two worlds will form a striking “double star” low in the eastern sky. They will appear only 1⁄3° apart — a bit tighter than that in the eastern U.S. — close enough for both to be easily covered by the tip of your little finger at arm’s length. You can start watching for Venus and Jupiter after they’ve cleared the east-northeastern horizon, as early as 80 minutes before sunrise, but make sure your view in that direction is wide open and unobstructed by trees or buildings. The best views will probably be from 60 to 30 minutes before sunrise, depending on how clear the air is, when the planets will be not quite so low. As close as this conjunction is for early risers in North America, the pairing will be even tighter for skywatchers in Europe. From there, Venus and Jupiter will appear just 0.2° apart, about half the width of a pencil held at arm’s length. Credit: NASA / CXC / SAO / R.Margutti et al. 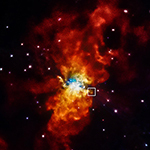 New data from NASA’s Chandra X-ray Observatory offer a glimpse into the environment of a star before it exploded earlier this year, and insight into what triggered one of the closest supernovas witnessed in decades. The data gathered on the Jan. 21 explosion, a Type Ia supernova, allowed scientists to rule out one possible cause. These supernovas may be triggered when a white dwarf takes on too much mass from its companion star, immersing it in a cloud of gas that produces a significant source of X-rays after the explosion. Astronomers used NASA’s Swift and Chandra telescopes to search the nearby Messier 82 galaxy, the location of the explosion, for such an X-ray source. However, no source was found, revealing the region around the site of the supernova is relatively devoid of material. The emission from organic molecules in the atmosphere of comet ISON as observed with ALMA. Credit: B. Saxton (NRAO/AUI/NSF); M. Cordiner, NASA, et al. An international team of scientists using the Atacama Large Millimeter/submillimeter Array (ALMA) has made incredible 3D images of the ghostly atmospheres surrounding comets ISON and Lemmon. These new observations provided important insights into how and where comets forge new chemicals, including intriguing organic compounds. Comets contain some of the oldest and most pristine materials in our Solar System. Understanding their unique chemistry could reveal much about the birth of our planet and the origin of organic compounds that are the building blocks of life. ALMA’s high-resolution observations provided a tantalizing 3D perspective of the distribution of the molecules within these two cometary atmospheres, or comas. “We achieved truly first-of-a-kind mapping of important molecules that help us understand the nature of comets,” said team leader Martin Cordiner, a Catholic University of America astrochemist working at NASA’s Goddard Space Flight Center in Greenbelt, Maryland.